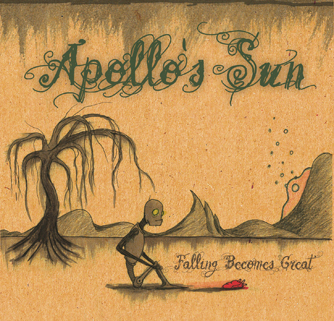 Falling Becomes Great by local rapper Apollo’s Sun is not your typical hip-hop album. One look at the album’s art (by artist Lakota Meyer) justifies that. On the cover, a drawing depicts a depressed robot that sits in a desolate area. To the left of the robot, a tree withers. On “Perfect Mistake,” Apollo addresses a female in an abusive relationship. “She chained herself to baggage/He was the baggage claim/She should’ve tagged it better when retreating off the plane,” Apollo says. “Daily Reminder” chronicles the ups and downs in his life. He highlights everything in his younger years from listening to Wu-Tang Clan to dealing with acid reflux. “Leave a Message” helps to give the album variety. On this skit, acquaintances, including J. Bair, leave voicemail messages over a beat accompanied by strings. Some of the song’s hooks on Falling Becomes Great tend to get repetitive. Nevertheless, Apollo’s conscious rhymes help to balance out local hip-hop.